Once again, Mary O’Brien has highlighted the need for everyone to look out for those doing it tough in rural Australia with a heartfelt poem, ‘The Hand Shake’, which she has written as a “salute to the toughness and softness of rural men”. Lately you have copped an absolute flogging from every angle; the general public, politicians, and Mother Nature are all doing their best to break you. I wish those who are so quick to judge you could see your true heart. 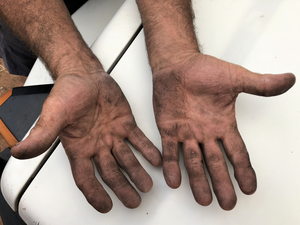 Your hands may be covered in dirt, cuts, bruises, callouses, scars, grease, mud, blood, sweat or tears but don’t ever apologise for your hands or what you do. Those hands are the story of your life. If people don’t want to shake your rough dirty hand, then they don’t see your story and they are all the poorer for it. Then glancing down he pulled it back, in shame and half disgrace. ‘Mate won’t bother me’ I quickly said, ‘it’s just a bit of dirt’. All the blisters, cuts and bruises, from him working on the land. The cracked and blackened fingernail, when he held a chisel for a mate. He may have seen those battle scars, but did he see the rest? The story of his life laid there, a toiler of the best. And from a muddy dam, they have pulled the dying stock. Then into church on Sunday, his partners’ hand they hold. They brush the frost off windscreens, as he starts while others sleep. Then they steer the massive road train, as it rumbles down the road. They clean the trough, shoe the horse, and help a lady change a flat. They gentle break the yearling colt, and draw mud maps in the dirt. They pass the footy, turn the snags, and check the gauge for rain. They have shovelled mud around the wheels, and have saved a baby bird. They’ve held a tiny tea-set cup, to see the smile upon her face. They have evacuated green frogs, and buried Fluffy when she died. They rub his aching back, as he dreams about some sleep. They’ve rolled a fleece, cheered his team, and passed a cold one to a mate. They tap the calculator buttons, in his office late at night. He has pressed those hands together, as he muttered prayers for rain. And then they rub his weary eyes, as he finally heads to bed. They check the crop has sprouted, as they scratch into the ground. Then they hold a tiny pushbike seat, and cradle children in their pain. They wrap around his family, as he waits for better days. They have tied his daughter’s laces, and thrown hay bales up on top. They’ve shorn the rams, checked the crops, and cupped water for his dog. And they wiped away his silent tears, when the crop got smashed with hail. Especially when I grabbed his hand, and shook it long and hard. ‘Mate, it’s just a bit of dirt’, I uttered one more time. If you’re watching with your heart, you see the story of his years.